"Hymnary" redirects here. For the online database, see Hymnary.org. Hymnal or hymnary or hymnbook is a collection of hymns, i.e. religious songs, usually in the form of a book. The earliest hand-written hymnals are from the Middle Ages in the context of European Christianity, although individual hymns such as the Te Deum go back much further. The Protestant Reformation in the 16th century, together with the growing popularity of moveable type, quickly made hymnals a standard feature of Christian worship in all major denominations of Western and Central Europe. 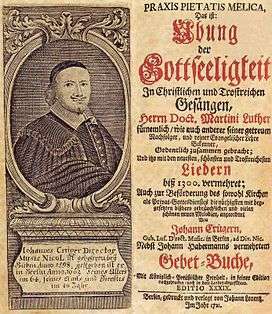 The first hymnal of the Reformation was Achtliederbuch, followed by the Erfurt Enchiridion. An important hymnal of the 17th century was Praxis pietatis melica. "Hymnary.org". — Extensive database of hymns and hymnology resources; incorporates the Dictionary of North American Hymnology, a comprehensive database of North American hymnals published before 1978. This article is issued from Wikipedia - version of the 7/23/2015. The text is available under the Creative Commons Attribution/Share Alike but additional terms may apply for the media files.